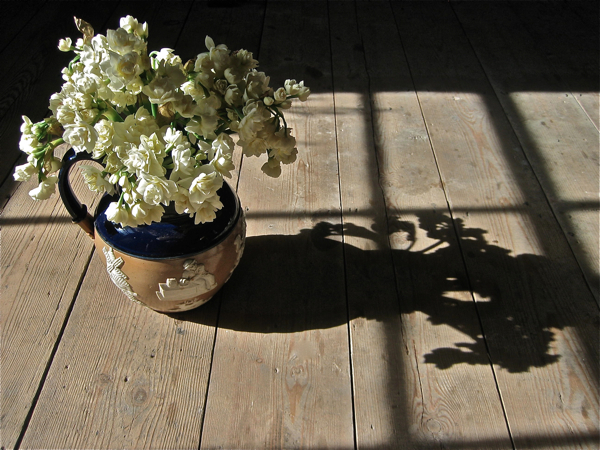 I bought these heavily scented Narcissi from Lisa Burridge at Columbia Rd, three bunches for just two pounds this week – possessing a pungent musky fragrance that fills my living room, and perfectly complementing the first flawless blue skies over the East End this weekend. 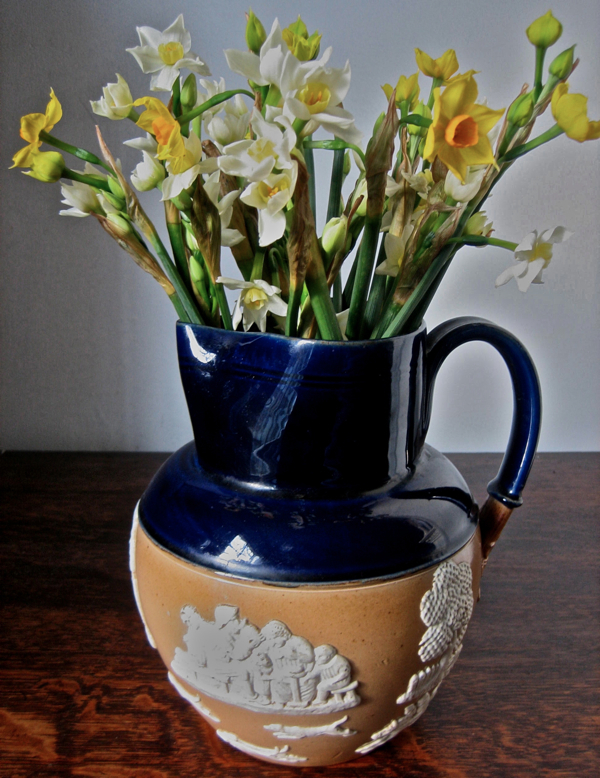 They are just one of the many subtly different varieties of English Daffodils and Narcissi from Spalding Market that Lisa has on sale now, at the peak of the season for Spring flowers. Waking early to sunlight, I am tempted to lie in bed watching the nesting birds coming and going from the bird house outside my bedroom window all morning, but it is a pleasure to rise when the sun offers such promise, and take a stroll up to Columbia Rd to visit Lisa Burridge at her stall and return with an armful of Spring flowers for the exchange of a few pounds. 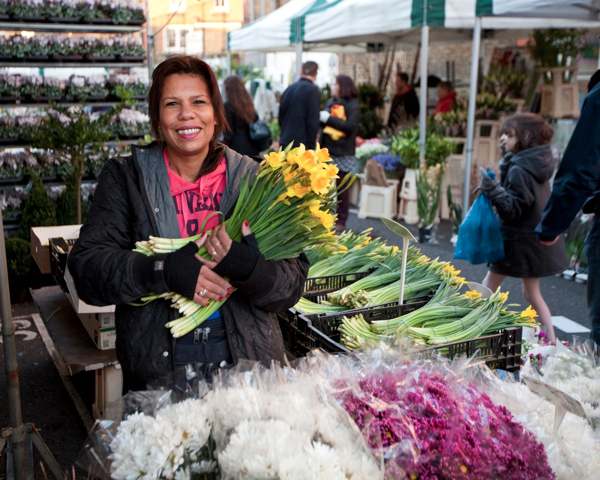 With her brightness of manner and sassy hoop earrings Lisa brings a touch of feminine glamour to the market, and it is always a pleasant diversion to stop by for a chat interspersed between the eager customers arriving to carry off flowers in delight. 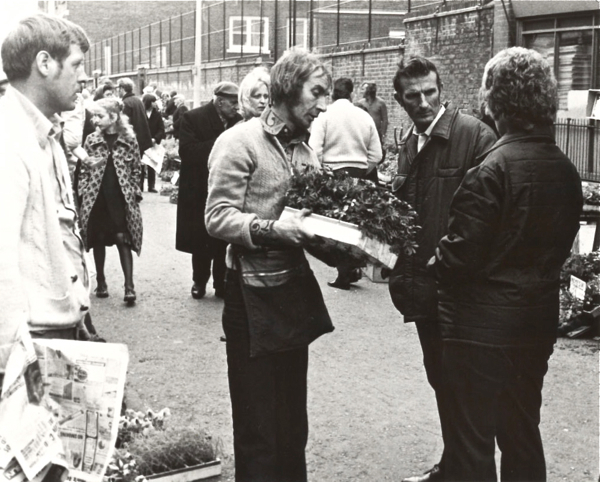 Lisa married into the Burridges – the family that over more than three generations have become such an integral part of the history of this market that they are considered the royalty of Columbia Rd. Lisa runs the cut flower stall on the one of the long-established Burridge family pitches for her husband Pete, while he manages the nursery in Hoddeston with his brother dealing in plants that are sold on another pitch. “It used to be forty stalls out of fifty-two here were Burridges once upon a time, Herbie told me,” commented Lisa in wonder. “More like twenty-one out of fifty-two,” qualified Pete with a good natured shrug, making a more conservative estimate as he arrived to join the conversation – though still quite an extraordinary proportion for one family in a market. “The old man liked to tell a tale,” admitted Lisa to me, flashing an indulgent smile, before she turned back to serve the next customer, reaching for yet another handful of the scented Spring flowers that surrounded her in a bower of pale yellow. The Spring flowers of 2010 from Columbia Rd. George Gladwell’s portrait of Herbie Burridge on the same pitch as Lisa, back in the nineteen seventies. So many Burridge’s! This is one family empire to be proud of! Daffodils are so beautiful this time of year, the variety of colours and scents so vivid.